Instant Pot Cheesecake with strawberries is a recipe that is so easy that you will opt for perfectly homemade every time! Top with strawberries, raspberry puree, or even doused in chocolate and caramel. You won’t mind tossing the no baked recipe when your Instant Pot does all the work. Worth the wait, your pressure cooker can help you make a stunning and tasty cheesecake with just a little bit of prep. Because you are using your instant pot, you will need an instant pot cheesecake pan, otherwise known as a spring form pan, in the correct size. The fresh crust with graham crackers makes the cheesecake, but do not be afraid of experimenting with other crusts like Oreo cookies. If you need some additional help, try our Pressure Cooker Guide! Pressure Cooker Cheesecake is Easy! Cheesecake is wonderful no matter how you make it. No matter whether you are baking a no bake rainbow cheesecake, eggnog cheesecake, or a classic cheesecake recipe, there really is no wrong way to slice the cake. In my house, the richness of cheesecake makes it reign supreme as one of the most decadent desserts hands down. I also love how versatile it is for toppings and it stays pretty good in the fridge for a bit. The problem is for many is that they want a traditional cheesecake but do not want to do the entire hours long process of slow baking. Fret no more! 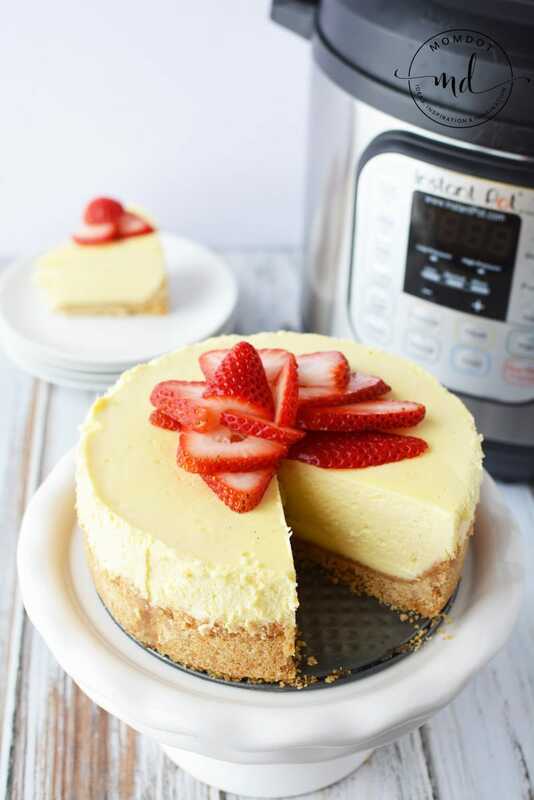 Due to the popularity of Instant Pot Pressure cookers, we have translated one of our favorite cheesecake recipes into an Instant Pot cheesecake recipe. 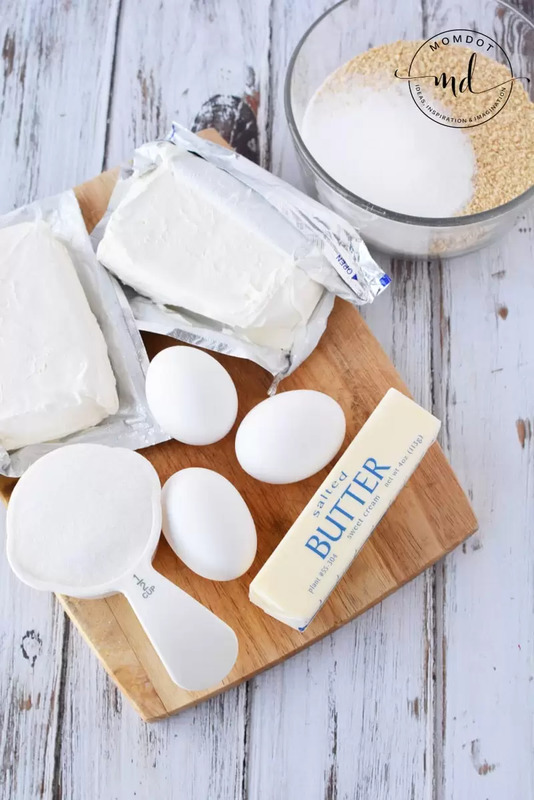 Making Cheesecake TIP: Before you get started, many people recommend bringing your ingredients to room temperature. To be honest, I am too impatient for that, but if you want it to be perfect you may not want to skip this step. Looking for other instant pot desserts? Try this Instant Pot Banana Bread! Mix graham crackers, sugar and melted butter together until coated well. Press firmly into the bottom of a 6″ springform pan using the back of a spoon or a pastry tart shaper. Mix cream cheese in a mixing bowl. Beat in sugar and mix well. Add vanilla and egg, one at a time beating well after each addition. 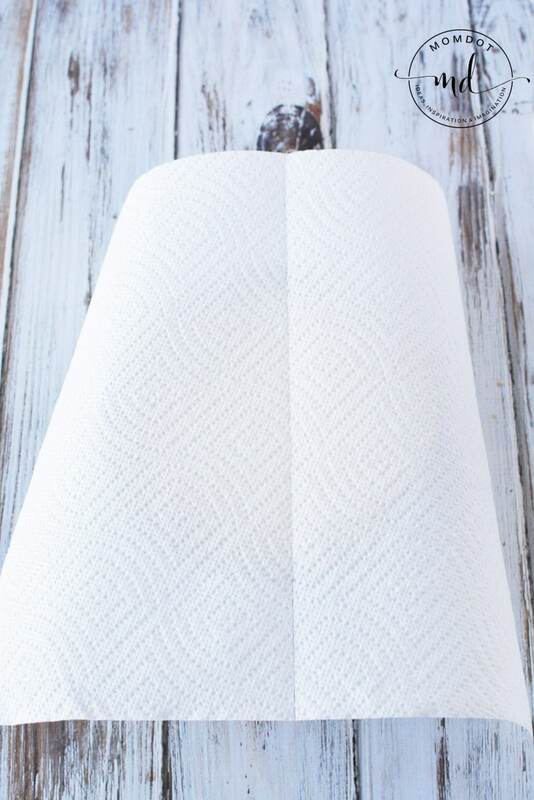 Cover the cheesecake with a single layer of paper towel. Cover the paper towel with foil and loosely wrap the pan. 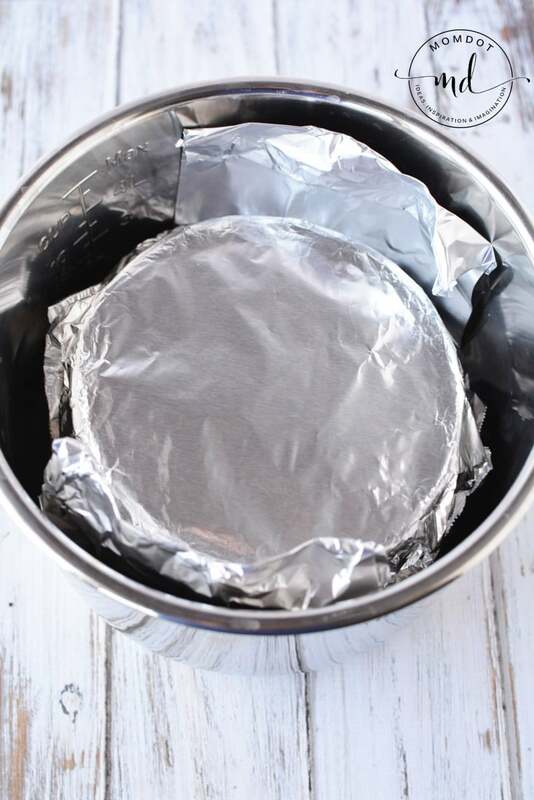 Fold a long piece of foil in half and place under the cheesecake pan. Fold up the ends to form a sling. Place the rack into the bottom of the instant pot and place water into the pot. Place the cheesecake and sling into the instant pot. Tuck in the foil sling ends if it extends beyond the top of the pot. Close the instant pot and the pressure release valve. Set the instant pot to manual, high pressure for 30 minutes. Let steam release naturally for 15 minutes before releasing the pressure valve and opening the pot. Carefully remove the cheesecake and sling and discard foil, paper towel and sling. Let set to cool on the counter for an hour before refrigerating overnight. To serve: top with fresh strawberries and slice to serve. Instant Pot Cheesecake with strawberries is a recipe that is so easy that you will opt for perfectly homemade every time! Top with strawberries, raspberry puree, or even doused in chocolate and caramel. You won't mind tossing the no baked recipe when your Instant Pot does all the work. Mix graham crackers, sugar and melted butter together until coated well. Press firmly into the bottom of a 6" springform pan using the back of a spoon or a pastry tart shaper. Place into the refrigerator. Mix cream cheese in a mixing bowl. Beat in sugar and mix well. Add vanilla and egg, one at a time beating well after each addition. Pour into prepared crust. Cover the cheesecake with a single layer of paper towel. Cover the paper towel with foil and loosely wrap the pan. Fold a long piece of foil in half and place under the cheesecake pan. Fold up the ends to form a sling. 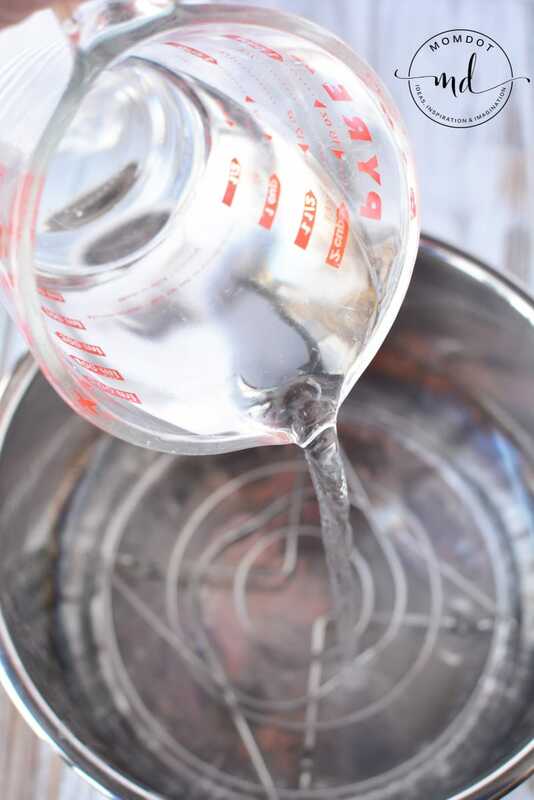 Place the rack into the bottom of the instant pot and place water into the pot. Place the cheesecake and sling into the instant pot. Tuck in the foil sling ends if it extends beyond the top of the pot. Close the instant pot and the pressure release valve. Set the instant pot to manual, high pressure for 30 minutes. Let steam release naturally for 15 minutes before releasing the pressure valve and opening the pot. Carefully remove the cheesecake and sling and discard foil, paper towel and sling. Let set to cool on the counter for an hour before refrigerating overnight. Please note the prep time does not include the pressure cooker heat up time or the overnight time in the fridge. I just made this, did the 30 min, 15 nr, the center was still jiggly? I put back for another 5min, I guess I’ll find out. how was it after it was in the fridge? Hit, Tina! You may need to adjust bake time, as the Instant Pot cheesecake will be thinner, but I dont think it will be enough to stress over. I dont have a 7 inch pan so I cannot give you exact on that, but if you happen to make the recipe and find out, you are welcome to message here or to me directly and Ill add for additional readers. Ill try to get one and test in the future. I made this recipe today in a 7” pan and changed nothing- it came out FANTASTIC! Thank you for sharing- I will definitely be making this again. Yay!! I am SO happy to hear that. Thank you for letting me know too! Wow!! That cheesecake looks incredibly dreamy! What can’t the instant pot do? I definitely need to get an instant pot soon! I had no idea how to make desserts in an instant pot! I have to try it. And that cheesecake turned out perfect. Yum!